Dialogues between Toppan and Strategic Capital | Improve Tosho’s shareholders’ value Strategic Capital, Inc.
Toppan Printing Co., Ltd. (hereinafter referred to as “Toppan”) is a parent company of Tosho holding 51.42% of voting rights as of September 2018. Both are listed (parent-subsidiary listings) and both hold RECRUIT shares as joint shareholders. We have sent letters to Toppan, too. 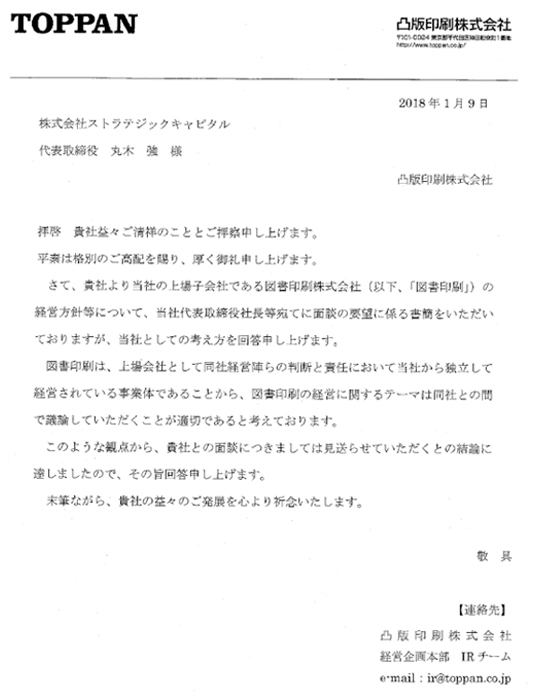 However, Toppan seems to have no intention to supervise Tosho as a major shareholder and replied that Toppan will not meet us and discuss with us. It is recklessness for Tosho to invest 20 bil in new business area and the ROE target rate, 1.7% 3 years later, is extremely low. We would welcome Toppan to give guidance to Tosho as its parent company that significant shareholders’ return will reduce Tosho’s net assets and improve its capital efficiency. Toppan group as a whole should make plan for Tosho where to invest in as new business area. Because Toppan is parent company of Tosho and required to improve the shareholders’ value of its subsidiary, we expect Toppan to supervise the governance of Tosho. – Tosho should reconsider its plan which does not improve any shareholders’ value. – Tosho should return excess cash and cash equivalents to shareholders which is not needed. We would welcome to meet and discuss with Toppan because we both are large shareholders of Tosho. Because Tosho is an independent business entity, Toppan refuses to discuss with Tosho’s shareholders about Tosho’s management. Following is the full text of the letter. We shared our opinion we expressed at the AGM with Mr. Kaneko, a new director of Tosho and a President & Representative Director of Toppan, who was absent from the AGM. Toppan should give consideration to the fact that our proposal regarding disposal of cross-shareholdings got ca. 36.5% favor votes by excluding Toppan’s votes. Directors of Toppan have an obligation to supervise Tosho as a large shareholder’s management. And we would welcome to meet and discuss about Tosho’s strategy. Though Toppan, parent of Tosho, invests in digital business funded by the partial “sale of RECRUIT shares”, Tosho continues to “hold RECRUIT shares” for expansion to digital business area. This appears that there is an antithetic digital strategy in the Toppan group. Not to leave Tosho keeping RECRUIT shares and inefficient capital allocation against Toppan’s strategy, we would like directors in Toppan to supervise Tosho as parent company’s directors as this is their Duty of Care. We would like Toppan to supervise Tosho to sell its RECRUIT shares, optimize its net assets, improve capital efficiency via special dividends and increase shareholders’ value, which is a mission for listed companies.